“The life of the dead consists in being present in the minds of the living." The installation "Darwin" attempts to chart the real time evolution of the ‘Darwinism’ meme. 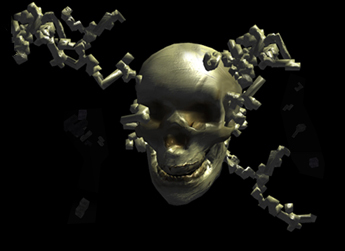 The work is generated from the activity of neo-Darwinist and Intelligent Design blogs. Computer software harvests semantic information gathered from these internet sites and then allows this data to be transformed into a virtual three dimensional construction. Effectively spotlighting the traffic of these internet sites, Darwin is a graphic portrayal of real-time internet activity. Appropriating technologies designed for gaming software and internet data harvesting, Cypher has created a work that offers the viewer/participant a glimpse of the internet in action. 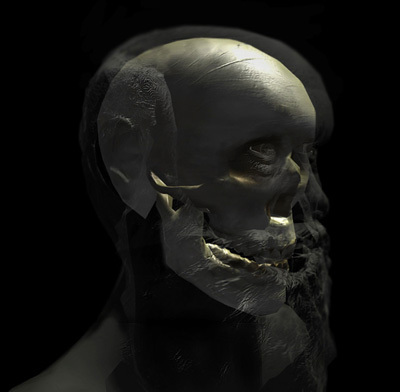 From the foundation of a virtual still point of reference – the head of Charles Darwin - the activity seems to visibly grow as it interacts with the rendered portrait. The forms and patterns that result are snap shots in time of the mutating “memory-in-the-system” that was once Charles Darwin and Darwinism. As biological information is passed through genes, so cultural information is passed through what Richard Dawkins has termed memes. (Dawkins 1976) Both genes and memes contain data that is inherited, replicated and passed on to subsequent generations. Neither genes nor memes act alone; both emerge out of a systemic relationship with other entities that support their propagation and replication. Genes require the correct cells, proteins, chemicals and environments to pass their information on. Likewise memes are also dependent on chains of entities (social, material and technical) that influence their assimilation, retention, expression and eventual transmission (Heylighen) into a network. In another words memes and genes are deeply shaped by the systems that they exist in. Bernard Stiegler argues that as objects or texts are used by successive generations they accumulate and inherit more and more information, which is inturn transmitted to future generations. (Stiegler, 2001) As a result the heritable information contained within is not left unchanged. When we consider the effect technological networks and vehicles like blogs have on this heritable information then memes can be propagated and hence mutated in a matter of minutes; disseminating units of cultural information with a life cycle in fast forward. In making use of existing technological systems a meme draws more and more relations to itself, enticing other entities to actively support, and if necessary, intervene in its propagation and consequent mutation. Similarly, the work Darwin attempts to chart the real time evolution of the meme Darwinism as it assembles itself in different configurations. Not necessarily over generations but in the "time space compression" (Harvey, 1989) of global networks. Each blog connects to a vast cumulative structure of influence made of social, scientific, technical and material entities and networks, and each will bring into being a difference in the original meme published by Darwin 148 yrs ago. Although an author may have contributed to composing a meme (with any number of social, scientific, technical and material entities and networks) she has almost no control over its trajectory or life cycle. Each system that supports a memes existence will equally influence a memes trajectory beyond an authors’ control. From this perspective it would seem that memes have the capacity to modify relations as they move; all the while accumulating alliances by infecting new hosts. Latour defines such influential movement as translation. (Latour 2005) Translation refers to the work that various entities do that modify, displace and translate various interests. That is to say, entities (memes, materials, environments) can expand their competencies by enrolling the interests of other entities and thereby mobilizing a collective trajectory; decided by the collective. This collective action can significantly influence a memes life cycle or trajectory that would have otherwise been impossible. The inherent beauty in a networks ability to mobilise and influence is its capacity to produce unintentional signs and structures, beyond the control of their maker. 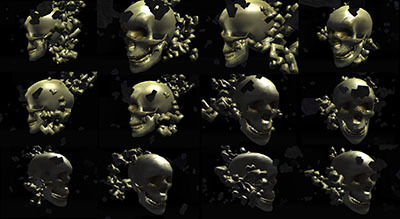 In other words entities in the work like Darwin, the software, text from blogs, data, the virtual skull, the virtual physics engine and the machines running this art work have the capacity to influence each other and change their relations beyond any authorial control -if in fact an autonomous author existed in the first place. The forms and patterns that result are snap shots in time of the mutating “memory-in-the-system” that was once Charles Darwin and Darwinism. Just as Charles Darwin himself would have examined fossil bones to draw connections between the ideas of his time and the bones of his ancestors. So to the work Darwin draws patterns and links between the meme Darwinism and its various permutations in the blogosphere; only this time and through the work, Darwin the paleontologist is now the focus of his own ideas.